The Roman Theater of Caesarea. 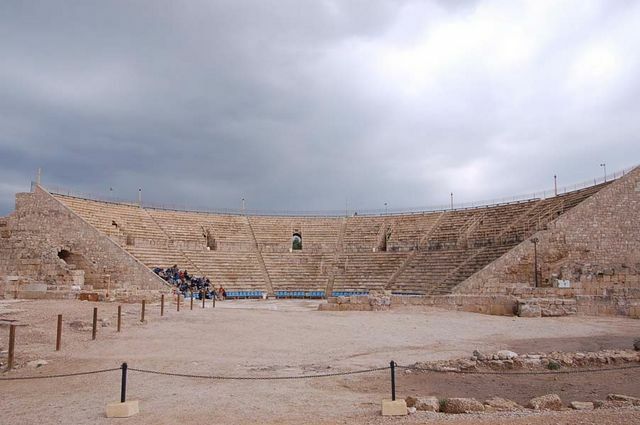 This most ancient theater in Israel is found in the southern part of the city of the Crusaders. It was built by King Herod Great, but over the years of its existence - right up to the Byzantine era - several times rebuilt. Caesarea is a unique archaeological park in place of an ancient city founded by Herod the Great in memory of the Roman Emperor Octavian Augustus. Currently, there are active archaeological excavations including underwater. Among the surviving ruins, the most famous are: ("Palace on the Reef"), the Hippodrome (stadium) of King Herod, reconstructed into an amphitheater, sections of city streets of Roman and Byzantine periods, a complex of Byzantine baths with magnificent finishes, a large artificial port of the Second Jewish Temple and fortified city -port of the Arab period, the ruins of the temple complex, in which the buildings of the Roman, Byzantine, Arabic periods and the Crusader era, fragments of the city wall were mixed up. Also interesting are the "Street of statues" of the Byzantine period, decorated with Roman statues, the ruins of the Byzantine synagogue, the remnants of the Roman fortress wall, the hippodrome (2nd century AD), and fragments of aqueducts. Among the archaeological finds is a plate with the inscription Pilate to the emperor Tiberius (the original is kept in the Museum of Israel). The modern city of Haifa with a population of 235 thousand people, located on an area of ​​54 square meters. kilometers, was founded in 1761 and built on the site of an ancient city, known since the III century AD. in the Roman period. In the XI century, with the Crusaders, the city turned into a significant Mediterranean port. Here is the main temple of the Baha'i religion with the unique terraces of the so-called "Persian Gardens". On Mount Carmel, with a height of 546 meters, the holy places associated with the Prophet Elijah are known. On Mount Caramel was founded the Order of the Carmelites in the XIII century. Acre is an ancient city, founded around 1500 BC. Sovremenny city with a population of 46 thousand people, spread out on an area of ​​10 square meters. kilometers, appeared in 1877. The old town of Akko is listed as a UNESCO World Heritage Site. According to archaeologists, the history of Acre has lasted for more than 4000 years. The city is mentioned in the chronicles of Amarna in the XIV century BC. In the old city, during the excavations in the period from 1954 to 1963, a number of multifunctional premises were identified, locally identified as the fortress-shelter of St. John, called "knight's halls". During the excavation of the dining room (the refectorium), an underground tunnel was discovered that leads from the fortress in the north to the seaport in the south. The fortress (Monastery of Hospitallers) is built in the form of four wings surrounding an open courtyard. The northern wing was built along the northern wall of the city, making the fortress an integral part of protecting the walls of the city and the main gate to the north. The famous fortress walls of Acre and the fortress of the northern part of the old town, built by the ruler of Acre Zakhar el-Omar in 1750 on the ruins of the fortress of the Monastery of the Hospitallers. Also known is the Al-Jazar mosque, also called the "White Mosque". Also attract the attention of the traveler inns - khans, bazaars and a Turkish bath (hamam Al-Basha). The excursion begins at the place of accommodation of the tourists in Jerusalem (the address and time of the excursion beginning is indicated in advance by the guide). On the tour you need to have comfortable shoes, drinking water and a hat from the sun. Clothes should be like when visiting temples (men should not visit temples in shorts, women should have clothes with closed shoulders, do not have a neckline, short skirts and shorts, you can wear trousers). At the request of tourists to the tour, you can add a visit to the city of Bethlehem, subject to departure from Jerusalem. To cross the border post between Jerusalem and Bethlehem, tourists need to have a passport with them. The price for all participants of the excursion on our car with departure from Jerusalem is $ 500 (with the number of up to 6 people in the car), and $ 750 (with the number of participants from 7 to 15 people). When you leave for a tour from Tel Aviv and its environs on our car, the price for up to 6 people is $ 700, and from 7 to 15 people - $ 950.